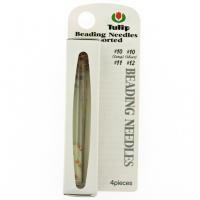 These beading needles from Tulip® are the best for your bead weaving and bead embroidery projects! The high quality Japanese design is bendable and flexible; these needles will pass easily through even the finest fabrics and will maintain its shape and resist breakage. They are much stronger and longer lasting than many other needles on the market! Large needle eye makes for easy threading. Quantity: 4 needles per Pack: 1 x 10 Short, 1 x 10 long, 1 x 11, 1 x 12.